Do you try to shop seasonally? I love taking advantage of produce when it’s in ‘season’ and the prices can’t be beat. In the Spring & early Summer that means Strawberries for us. I really think I could live for quite some time on just clam shell after clam shell of the bright red berries alone. <Insert some nonchalant whistling here> Don’t mind me while I sit here with several pounds of berries on my lap, juice dribbling down my chin and sticky fingers- totally worth it for each and every bite. When the real heat rolls in, in the heart of Summer, though berry prices jump right back up. Other than special occasions, or a really intense craving, at this point my strawberry days are pretty much done until next year. Usually I’m able to make my peace with that. Though I’d be lying if I said I didn’t need the forced break just to avoid making myself sick and going off them for good. Still I’m always just the teensiest bit sad when I leave the produce aisle. 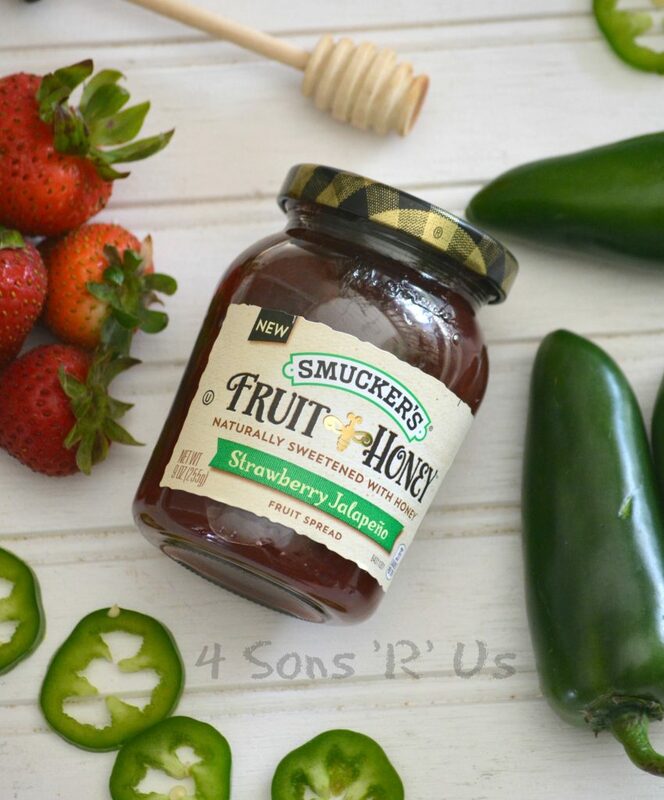 With just a glance I immediately noticed something NEW on the shelves, something in particular that was new from Smucker’s: Smucker’s Fruit & Honey Strawberry Jalapeno Fruit Spread. Taking my favorite Spring & Summer berry and pairing it with a bold burst of jalapeno? That was simply genius! Fresh fruit, bold flavor, and lightly sweetened with honey– that’s like love in a little glass jar. And I bought enough love to ‘spread’ around! In addition to the Strawberry Jalapeno, I got some of the more traditional options as well, like Concord Grape, Triple Berry, and Blueberry Lemon. Don’t be surprised, of course I stocked up. Such simple ingredients, but such perfectly blended flavors– talk about a much better for you addition to any pantry. Now there’s no stopping this strawberry fix of mine. With so much of my time and thought going into what’s better for my family, I’m also always looking for things that are better for me. And you know what? I decided the things I could do with this Strawberry Jalapeno fruit spread, would be great for me. 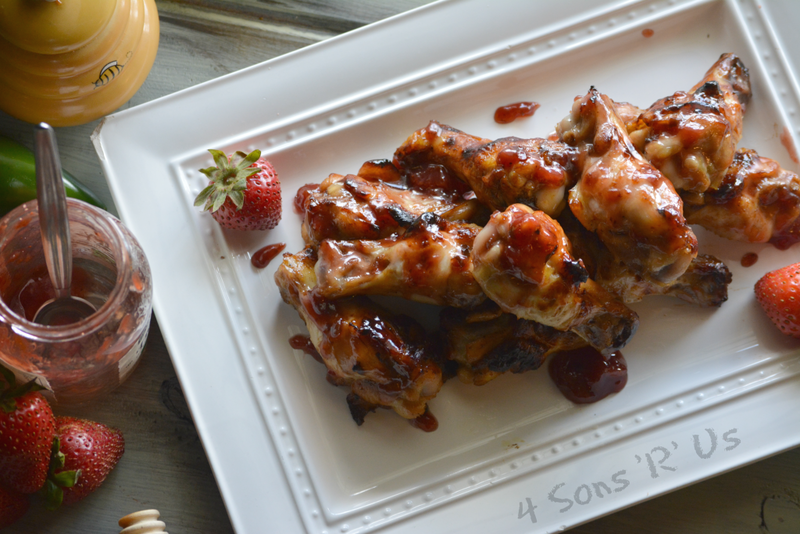 Especially when I could incorporate it into a 3-Ingredient recipe for Strawberry Jalapeno Chicken Wings. I mean talk about easy AND great tasting. Greater still? Cooking them on my grill would save me time and keep the heat out of my kitchen and outside where it belongs. The fun doesn’t stop there though– these bad boys are versatile! In addition to an easy supper, they make a great light lunch. Bring ’em to the next big barbecue for a real show stopper. Game day grub? These wings have got your back. You’ve got to get in on the action. 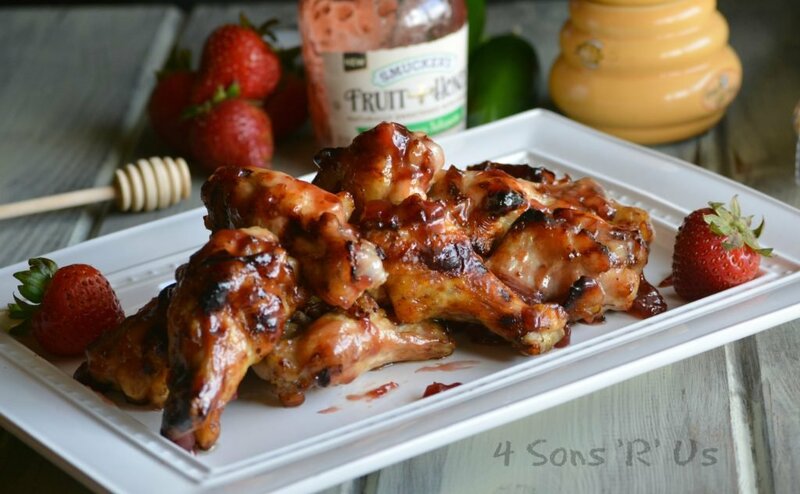 Tender, juicy marinated chicken wings are grilled until crispy and then basted with Smucker’s Fruit & Honey Strawberry Jalapeno Fruit Spread, for a perfect marriage of sweet and heat that just begs to be eaten. It doesn’t get quicker or easier than this. 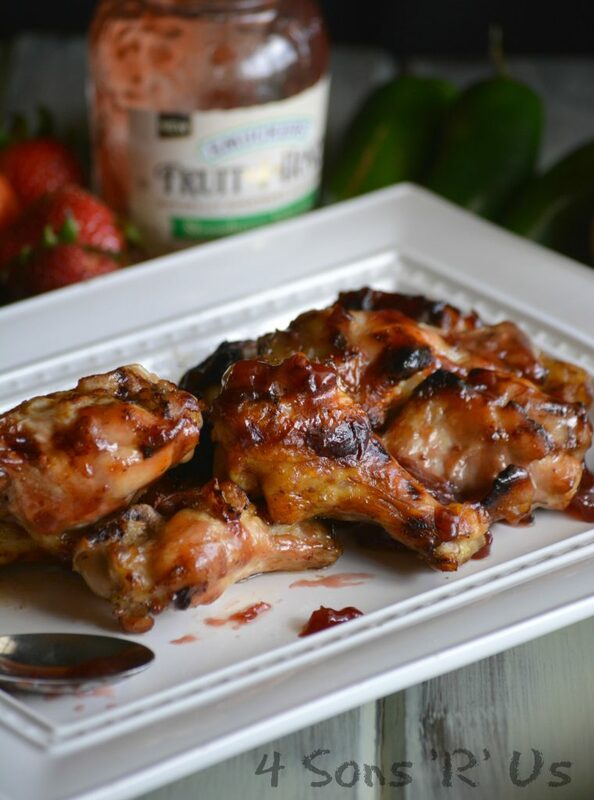 Pair these Strawberry Jalapeno Chicken Wings with a yummy side salad for a full meal that’s as hearty and healthy as it is tasty. A simple 3 ingredient recipe for marinaded, crisp yet tender grilled chicken wings with a bold sweet and heat glaze. Remove the chicken wings from the packaging and use paper towels to pat dry. Transfer the dried wings to a large tupperware container or zip-locking storage bag. Add half the fruit spread to the container, and squeeze in the juice. Seal the container and give it a gentle shake to stir the marinade around and evenly coat the wings. Refrigerate the marinading chicken for at least an hour, flipping every twenty minutes. When the grill is heated, transfer the marinaded chicken to the rack. Return the lid to the grill and cook for 15 minutes. Baste the wings using some of the remaining fruit spread. Save the leftover spread, and return the lid, cooking the chicken an additional 15 minutes or until fully cooked and crispy. Use tongs to carefully transfer the cooked wings from the grill to a serving platter. Baste them again, liberally, with the remaining spread just before serving. Before heading to the store, download the Ibotta app to earn $1.00 off your own jar of Smucker’s Fruit & Honey Spread. Thank and I know neither of you will regret it, Janet! How fun are those? 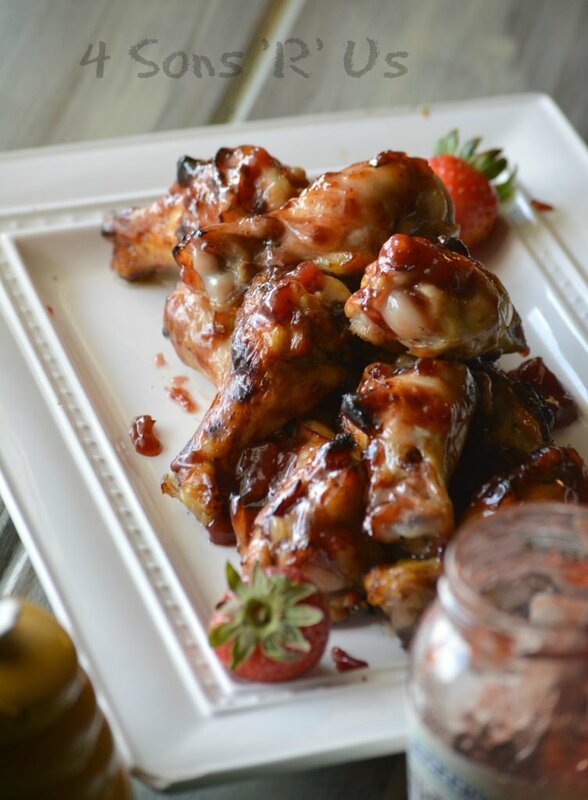 I love sweet/hot jelly on cream cheese and cracker but putting it on wings is genius! Yes! I love pepper jelly on cream cheese with crackers for a simple appetizer. Simple flavors sometimes make the best meals! 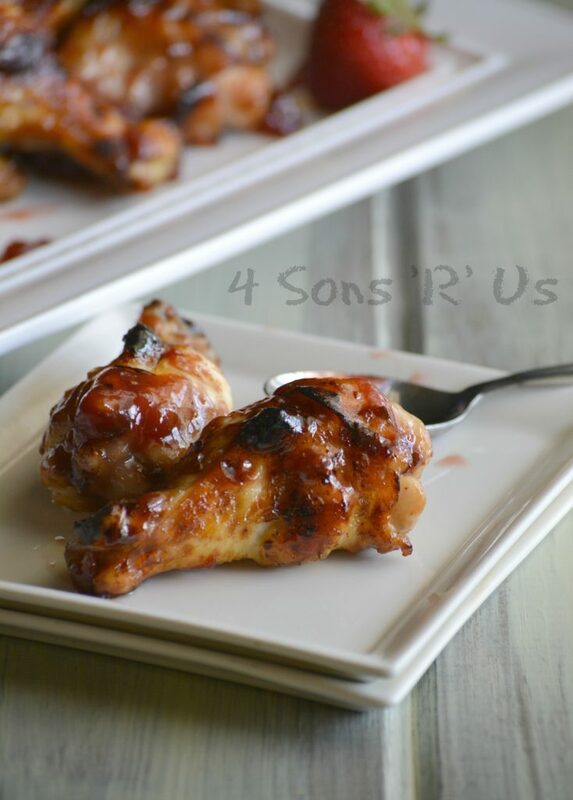 This is the perfect sweet with heat type jam for these wings. Simple and oh so delicious. Party food at it’s best!! I couldn’t agree more, Gloria! Thank you!! This is the 2nd recipe I’ve seen today w/ this strawberry/jalapeno jam. Oh my is my mouth watering. I love a little combo of sweet/heat! You’ve got to try it– it’s so yummy and it can be incorporated into so many different meal ideas. Breakfast, lunch, dinner– even dessert! Yum! I have had this jam before, but I never thought to use it as a marinade. Great idea! These really do look delicious! I will need to make it soon. Spicy strawberry jam would be great on so many dishes. I haven’t seen this in stores so I will have to look for it next time I shop. Oh, yes– so many possibilities, I can’t wait to dig into more of them. 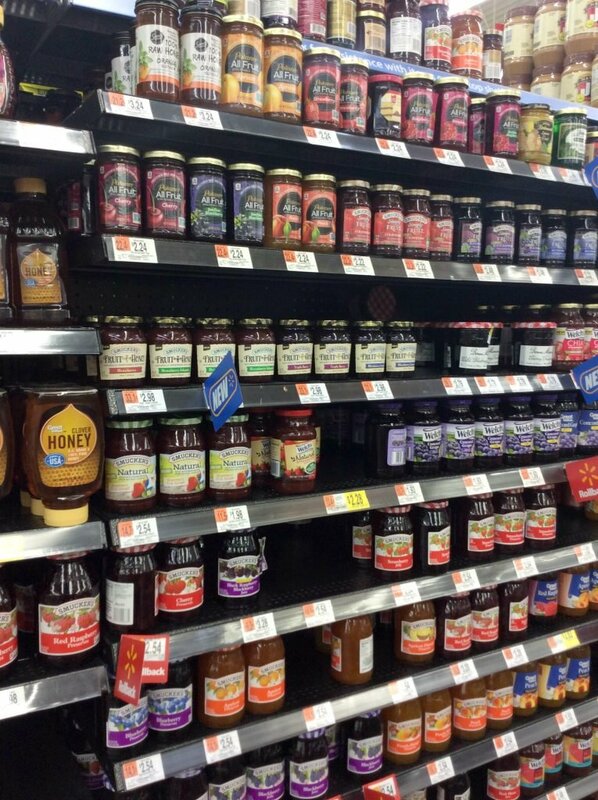 It’s easy to find near all the other jellies and jams. Oh, fruit with honey – this sounds awesome! I haven’t seen this product before, but I’ll definitely be looking for it. And the wings? Oh YES! I love sweet and spicy chicken wings! I bet that jelly does the trick! Oh, it does Jamie. The best part? Using it makes this recipe a breeze to throw together. Yep, it’s definitely our new go to wing recipe and perfect Summer fare. Gone are the days of a couple choices of jam – now you can find dozens. Do people really buy all these varieties? I would love it! Thanks for sharing – enjoy your weekend. They keep coming out with new awesome flavors, so it’s a fair bet we’re not the only ones buying them and loving it! I couldn’t agree more, and I’m all about embracing and incorporating the wide variety of flavors each season. I haven’t made wings in ages – not since my son moved out, I think. You’ve outdone yourself and I might just have to get on the ball!! Yes, you should– or save them and surprise him on his next visit home! It is, and that’s one of the things I love most about it. Thanks, Kim! Pingback: Chicken Wing Recipes - 70+ Recipes For Any Sporting Event!